Once upon a time, back when we bought the building that is to become the home of Dimes Brewhouse, we were aware that one of the corners in the basement was damp. It happened to be a corner of the building that was drywalled in, so it wasn't easy to see the extent of the water problem. A few months later, a lot of snow melted, and water crept across the floor in that corner and along the adjacent wall. We got down there with mops and buckets and soaked up the inch-deep giant puddle. That spring, we had a few heavy rainfalls, and water puddled up again; this time in the same place but also in the back of the building near our sump. At this point, we knew we had a real problem. Every time it rained, we were back down in the basement mopping up the water. We had to investigate problem area #1 - the corner, so we peeled back some drywall. Which led to quite a mess. We found that the water wasn't just coming through the bottom corner where the wall meets the floor, but through the walls themselves. The cinder block walls were full of water, and it was slowly leaking through. We brought in several different companies to check out the problem and quote their suggested solutions. They all jumped right to their interior drain systems. Every company has a slightly different way of doing it. They are all expensive. We decided to take a step back and look at all the options. We went through another winter, and when the snow melted and springtime rain came, we had water entering in even more places than last time. The "best" way to fix this problem is to excavate the ground around your building, waterproof from the outside, replace the exterior drain tiles, and re-do the backfill. This is ridiculously expensive, and not to mention the fact that we'd have to pay to rip up the paved alleyway next to the building, and dig out under the front porch. There also just isn't much room between our building and the edges of the property, so this option was not feasible. A coworker suggesting using DryLoc (a thick, waterproofing masonry paint). Reading reviews online, it seems to work great for most people, but I read a few horror stories of Dryloc actually encouraging mold growth. That was enough to make me run the other way. With a brewery, you have to be extra careful about different types of microbes lurking about. It sounds like it might be a great solution if you have mild, occasional moisture issues, but I don't think it would work for an area that is constantly wet - we wouldn't even be able to dry out the corner in order to apply the Dryloc and get it to adhere to the wall. And of course, the possibility that it would cause mold issues. Eek! My dad recommended new gutters and downspouts. Getting the water farther away from the building should help. Also, the ground under the porch and on one side of the building seems to have settled, so he said we should fill in any low areas around the building with clay. We were actually all set to charge ahead and get new gutters when we realized that the facia and soffits need replacing, too. The company we were going to go with for the gutters didn't do that type of work, so we hit pause on the gutter project. Then it didn't rain for oh, 6 to 8 weeks? It was dry as a bone outside. All the grass was brown and crunchy. And the original problem corner of the basement was STILL WET. GRRRR!!!! Clearly, gutters and fill dirt weren't going to fix that situation. So this brought us back to square one: the interior drain system. We were told that it's much better to deal with water from the outside, so this should be a last resort. In our case, the other options didn't seem viable, so we went with it. Most interior drainage systems use basically the same concept, with some slight variations in the design. The company that we decided to go with, Ayers Basement Systems, did a professional job. They jack-hammered the concrete floor out about a foot from the wall to expose the footing of the foundation. They drilled small holes in the cinder block walls just above the floor, so that the water that inside the walls can drain out through these holes. Then they installed their drain system, which in the case of Ayers, sits on top of the footing, in a bed of gravel. Not our basement, but this is exactly the type of drain that Ayers installed for us. Behind the little gap between the wall and the drain, there are holes drilled into the cinder block wall, that let water flow to the drain. Water from under the floor can seep up through the gravel to the drain as well. Then they poured new concrete over the drain. Water from under the floor and inside the walls seeps into this drain system, which carries the water to the sump. We now have a nice new sealed sump pump! The sump pumps the water out of the basement, 30 feet away from the building, to a drywell. 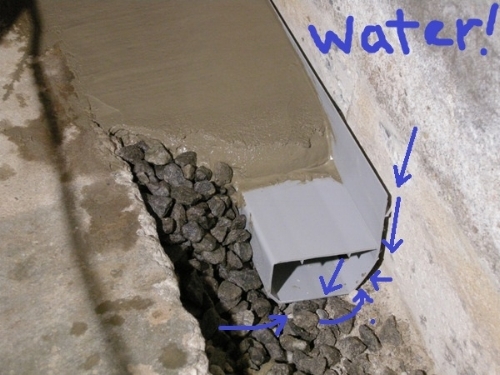 (Right) Ice Guard: In case the underground drain ever freezes, the ice/water will spill out of these holes, instead of backing up into the basement. (Left) Water will normally seep back into the ground from the drywell, but if there is ever a big storm and it floods, the water will bubble up to the surface here. Now that we have this system, we have a guarantee from Ayers that the basement will never be wet for the life of the building. Now we can live happily ever after, with peace of mind that our basement will be dry forever. The end!